When Suzanne Goldschein went back to Germany with her younger sister to visit the site of the displaced persons’ camp where they lived as children, they made a side trip that made such an impression on her it would consume the next eight years of her life. 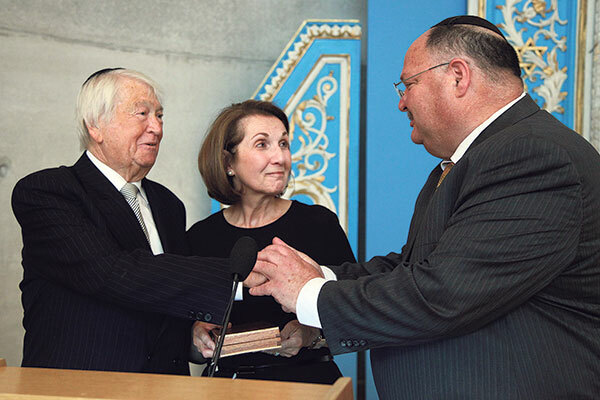 “As the daughter of Holocaust survivors, I was invited to attend an international gathering in Munich in 2008 which included a visit to the Foehrenwald DP camp and an unscheduled stop at a Jewish cemetery in the town of Gauting,” the Elberon resident told NJJN. There, nestled within the Christian cemetery, are the graves of 128 Jewish patients who died after the war ended in the nearby Gauting Sanatorium, a medical facility for tuberculosis patients. For Goldschein, seeing the graves — even from a distance — awakened close associations for her; she herself is the daughter of a former patient of the facility. Her “exhaustive” journey researching the histories of the sanatorium patients ended with her being asked to have that research sent to be housed in the archives at Yad Vashem. She and her family were at the memorial and museum in Jerusalem May 30 for the unveiling of a plaque in the “Memorial Cave” commemorating the 128 who died at Gauting. Goldschein also received the Key to Yad Vashem from Shaya Ben Yehuda, the managing director of its international relations division. Among those attending the ceremony were Dr. Clemens von Goetze, Germany’s Ambassador to Israel; Rabbi Shlomo Riskin; and two former Gauting mayors, Dr. E. Knobloch and Brigitte Servatius. Also present was Sabine Baumgartner, a non-Jewish German woman who voluntarily tends the Jewish graves at Gauting and arranges an annual yahrtzeit service presided over by a rabbi who is brought in from Munich. Goldschein’s research had led her to a book by Dr. Walter Fuernrohr and Felix Muschialik, which included patients’ “heartrending” Yiddish poems and letters expressing their longing to go to Israel where they hoped the “good air” and sunshine would cure them. “My original plan was to exhume the bodies and reinter them in Israel, and I tried different routes to get them there,” said Goldschein. When that plan failed, she began asking German friends what they knew about Gauting, which is still in use as a TB sanitarium. She learned that the survivors who had died were not buried in a Jewish cemetery because of the expense of transporting the bodies after the war. A local rabbi made the decision instead to create a small Jewish section in the Gauting cemetery. Baumgartner was also a font of information. Goldschein’s father, David Goldenberg, survived the war hiding in the forests of Czechoslovakia. He married a woman from a neighboring Czech town after the war. Goldschein was born in 1949 at the Ulm DP in camp in Germany, and during the first five years of her life, her father was a patient in Gauting. Goldenberg recovered, although the illness quashed any chance he had to bring his family to the United States or England as he had hoped. Goldschein recalled that her mother, who had survived Auschwitz, would visit her husband every day. The couple, realizing they wouldn’t be able to emigrate, left the Foehrenwald DP camp in 1957 and settled in Munich with their two daughters. Following the incident, her Orthodox parents sent her in 1963 to live with an aunt in Los Angeles. In 1971, Goldschein married her husband, Lenny, also a Holocaust survivor. They came to New Jersey in 1978 and belong to Congregation Brothers of Israel in Long Branch. The couple has two sons and seven grandchildren.